Our series profiling the next generation of antiquarian booksellers continues today with Matthew and Adrienne Raptis of Raptis Rare Books in Brattleboro, Vermont. They recently released their first catalogue, which we reviewed last week on the blog. NP: How did you both get started in rare books? AR: Matthew started collecting books when he was a young child. He was very interested in history, particularly the American Civil War, and started with a small collection of antiquarian books. His collection grew over the years to encompass many other fields, from literature to photography. The business in rare books was a natural development from his passions. I came into the business by virtue of being married to Matthew, so it was less of a direct journey. My degrees are in the sciences, but I have always loved books and read voraciously. A funny thing is that I used to pretend when I was a child that I was a bookseller. We actually came across a photo this past year after we returned from the San Francisco book fair that shows me with my books fanned out in a very similar way to how our books our displayed when we are at a fair. It must have been destiny because I love this business and being surrounded by such amazing pieces of history. NP: When did you open Raptis Rare Books? AR: We officially became a business in 2003 and joined the ABAA/ILAB in 2008. NP: What does Raptis specialize in? AR: We try to have a stock of landmark books in all fields, but we specialize in literature (particularly modern first editions), children's books, economics, photography, architecture, and signed and inscribed books. NP: What roles do each of you play within the company? AR: Matthew does almost all of our buying. He has an uncanny ability to find great books. He seems to have an intuitive 'sixth sense' about knowing where to look and what to buy. We have both travelled extensively and wherever we go, whether it be South Africa, Russia, or western Massachusetts, he always comes home with treasure. He also does most of the communication with our clients. I mostly do the 'behind the scenes' work of our business, such as organizing information for book fairs, the website, and putting together our catalogue. AR: There are many things we love about the trade. It is a very unique business to be in--it changes from day to day and we are always learning and growing. It gives us a great deal of flexibility and we are blessed to have the opportunity to view and handle exciting objects of art and literature. 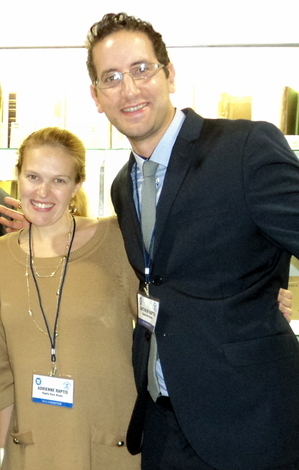 We enjoy doing book fairs, particularly in meeting up with colleagues and clients who share the same passions. AR: That is a hard question because so many books are interesting in their own way. One book that we just purchased is the most interesting to me right now--it is a first edition of Profiles in Courage nicely inscribed by John F. Kennedy to fellow Massachusetts Senator Leverett Saltonstall. Association copies like this are always interesting not only because they are rare, but also because of the importance of the history of these items. NP: What do you two personally collect? AR: Our personal collection is quite varied, but we've recently been purchasing more and more fine bindings and vellum. NP: Any thoughts on the future of the book trade? AR: Although I think the used book market is hurting more with the invention of reading devices such as the Kindle and Nook, it seems that the collectible book market is actually getting somewhat stronger in our experience. I think people have even more nostalgia for the physical book now and creating a good library will always be in fashion. We meet many young people at book fairs who are extremely interested in rare books. It is always enjoyable to talk with them and see the enthusiasm they have. AR: Putting together our first catalogue was quite an exciting endeavor and we've received very good feedback on it, including a nice review in Fine Books & Collections. You can download a copy of our catalogue online by going here. You can also request a hard copy by calling us at 802.579.1580 or emailing us at mail@raptisrarebooks.com.